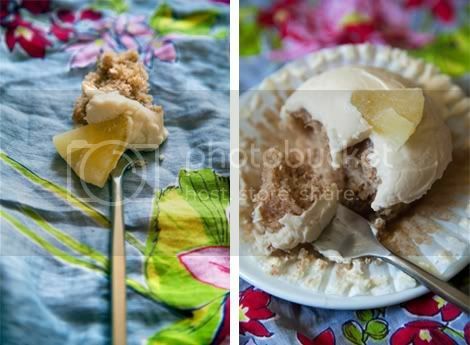 Hummingbird Cake, a delightful traditional southern dessert, gets a pure vegetarian makeover as easy to bake cupcakes. The eggs have been omitted, so these aren't your grandma's old-fashioned cake — although I'm sure she'll love them (and never miss those eggs). The original Hummingbird Cake recipe was first published in Southern Living magazine in 1978 and has since become the magazine's most requested recipe — you can find it here. 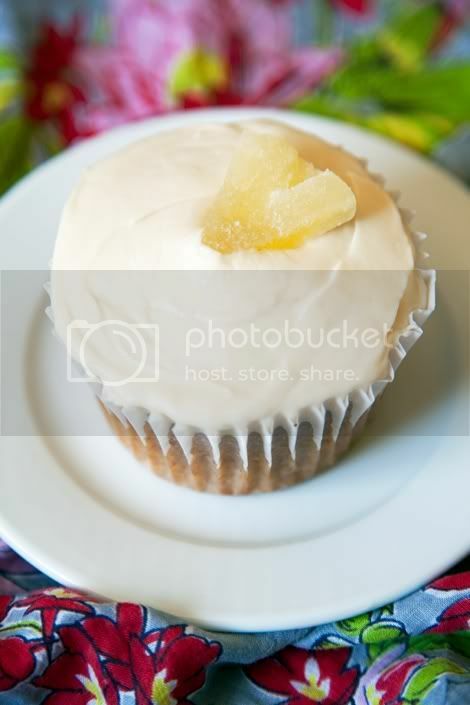 For my veganized version, I've also added shredded coconut a'la Martha Stewart's recipe for Hummingbird Cupcakes. A side note: This recipe makes a half-dozen jumbo cupcakes. Baking time will be less, and the recipe will yield one full dozen cupcakes if you are making regular-sized cupcakes. Baking time may also vary according to your specific oven. Make the cupcakes: Preheat the oven to 350°F. Line a muffin pan with cupcake liners. Sift the flour, baking powder, salt, and cinnamon into a large bowl. In another large bowl, mix together the pineapple, banana, oil, sugar and vanilla. Make a well in the center of the flour mixture and add the wet ingredients. Mix well; there will be some pineapple clumps and that's fine. Spoon the batter into cupcake liners so that they are about 3/4 of the way full. Bake for 25 to 27 minutes or until a toothpick inserted into the center comes out clean. Let the cupcakes cool for about 10 minutes then remove them to a cooling rack to finish cooling. In the meantime, make the frosting: Cream the Earth Balance and Tofutti cream cheese together until just combined. Use a handheld mixer to whip while adding the confectioner's sugar in 1/2 cup batches. Mix until smooth and creamy, then beat in the vanilla. Keep tightly covered and refrigerated until ready to use. Decorate the Cupcakes: When the cupcakes are cool, remove the frosting from the refrigerator and spoon even amounts onto each cupcake. Spread the icing over each cupcake until smooth and the tops of the cupcakes are covered. Garnish with a slice of dried pineapple. Store in the refrigerator and bring to room temperature before serving. Thanks, Dawne! You should definitely invent a reason to make them, they tasted pretty awesome, too. How many cupcakes does this reicpe make? You should get a dozen regular sized cupcakes from the recipe.